Jews around the world gathered on Sunday for first-ever global Shofar FlashMob, a two-minute shofar blowing and call for repentance. Jews around the world gathered on Sunday for first-ever global Shofar FlashMob hosted by Art Kibbutz NYC, the newly-launched international artist community. The event was meant to give the Jewish tradition of sounding the Shofar daily during the Hebrew month of Elul a 21st century post-modern twist. The Shofar, traditionally made from a ram’s horn, was used in Biblical times for many purposes, including announcing the new month, to herald the commencement of the festivals and in battle. Besides being sounded during Elul, the Shofar is also sounded on Rosh Hashanah and at the conclusion of Yom Kippur. There are ten reasons given for blowing the shofar on the High Holydays, the most well known of them a reminder of the willingness of the Patriarch Abraham to sacrifice his beloved son Isaac to G-d until a voice from heaven told him not to touch the boy. He sacrificed a ram whose horns were entangled in a nearby bush instead. The FlashMob groups, which included artists and creative volunteers, all blew the Shofar together at a designated public space for two minutes as a call for teshuvah (repentance). 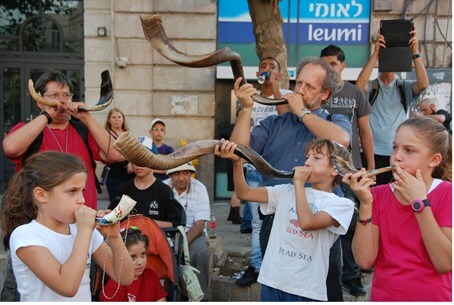 This was the first-ever FlashMob utilizing a Shofar. The teams around the world were synchronized and the creative event was documented and will be incorporated into an artistic Rosh Hashanah electronic greeting card, orchestrated by a composer. Art Kibbutz NYC is the brainchild of author and impresario Patricia Eszter Margit, who received support for the Shofar flashmob from the ROI Community of Young Jewish Innovators, a worldwide network of young social entrepreneurs created by American Jewish philanthropist Lynn Schusterman. The Jerusalem Shofar FlashMob at the Ben Yehuda pedestrian mall featured Rav Kook’s Shofar poem, performed by Rabbi Yitzhak Marmorstein of HaOrot: The Poetic Lights of Rav Kook, which combines Rav Kook’s poetry with Jazz.